Flowers tell us that the world is really beautiful and enchanting. Makes us have faith on nature. Reminds me what Walter Hagen said: You’re only here for a short visit. Don’t hurry, don’t worry. And be sure to smell the flowers along the way. It’s always a delight watching a flower in full bloom. More so if the flower wears your favourite colour. Purple being one of them. It has been more than a week since the Purple Bauhinia trees in Mumbai and Thane are flush with their showy flowers and ornamental foliage. I chanced the season’s first bloom in the park where I jog. Most were on trees and few scattered on the ground. Had they been jasmine or other sweets smelling flowers they would have picked up to be placed in front of the altar but not these. Each time I passed I sent a kiss towards them which my daughter who accompanied found annoying. My action was to thank them for the beauty. The lone Purple Bauhinia I have planted on the edge of my farm is still too young but I’m hoping it will soon bloom: for it blooms twice a year. I take solace on what Henri Matisse said: There are always flowers for those who want to see them. Before the Purple Bauhinias wither and fade away this season do have a dekho at them. It’s that time of the year when you can chance upon these purple flowers growing in a garden or just off the road. I saw one peeping from the high walls of Parshavnath College in Thane and another when my curiosity took me to Demello Nursery, near Andheri Station (west). The elderly Demello was pleased to share his knowledge about gardening and horticulture. Demello have been running their nursery from here since the last one decade. Earlier to that they had a garage which they closed following losses. Demello Nursery sources its plants from Karjat and offers its services to corporate office in and around Andheri. Just off the maddening and cacophonous SV Road, Demello Nursery is a haven. Once you’ve entered its premises with potted plants on both sides you can’t hear the noise from the road, as if the plants have screened the noise out. “This will flower till late December,” Demello said. 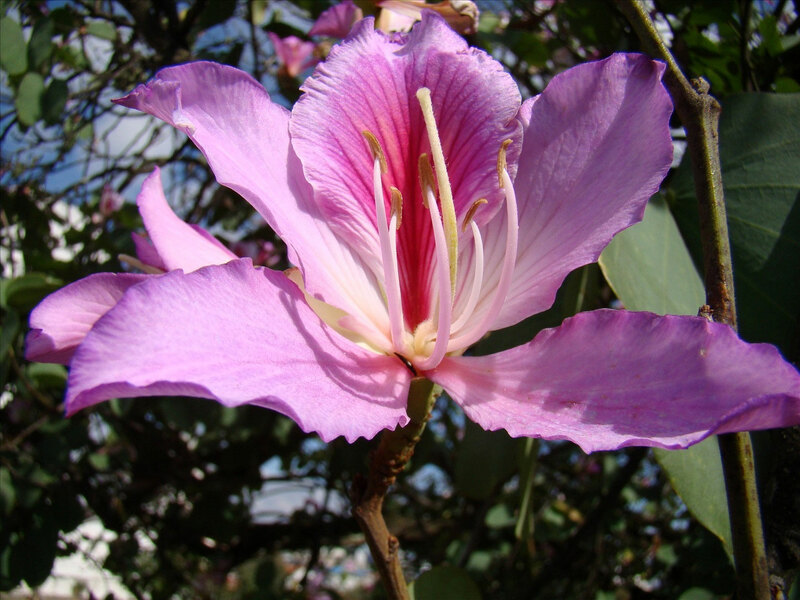 So taken in was I with the purple flowers of Bauhinia that I returned two days later and clicked some pictures. If you’re passing by, do drop in to see the full bloom. It’s likely you may not come across such a sight while you commute daily to work and office. 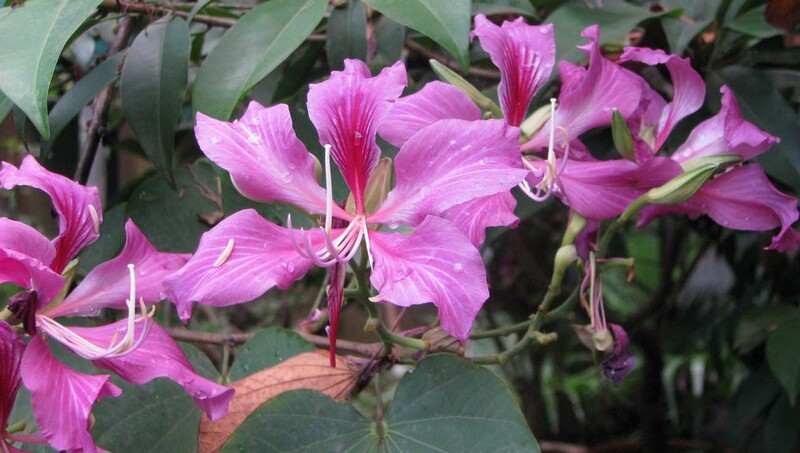 Purple Bauhinia begins flowering in September and continues till late November. In Hindi it is called Kachnar. Remember the song Kachchi Kali Kachnar Ki, Kya Samjhege Baatein Pyar Ki (Hungama 1971). In Marathi it’s called Rakta Chandan (What an evocative name? ), in Bangla its named Koiral and in Kannada Devakanchan (God’s Gold). 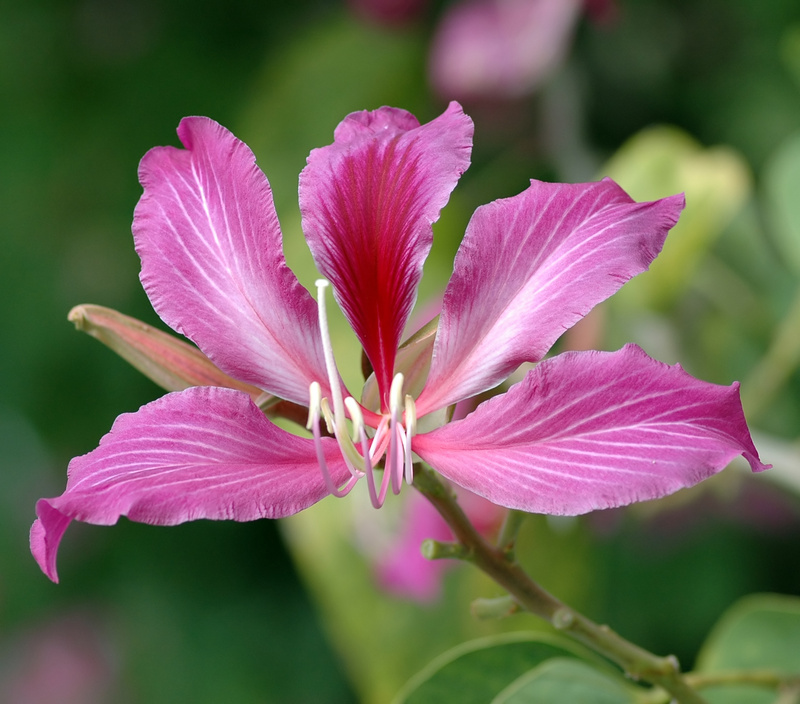 In English it is called by different names, like Butterfly tree, Pink Butterfly Tree, Purple Bauhinia, Purple Butterfly tree, Hong Kong Orchid Tree, Purple Camel’s Foot, Hawaiian Orchid Tree and Purple Orchid Tree. How does the same flower get different names in different languages and region? Was naming it the work of a peasant, a housewife or a poet with his vivid imagination? My guess: poet. Interestingly, within a region it holds a common name. April-May is the season of Purple Bauhunia and you’re likely to come across it with its blooming purple, pink, and lavender petals flowering at roadsides, in parks and in gardens. Arranged closely to resemble an orchid, its heady perfume fills the nostrils as you move close to the trees. In our rush to become ‘techlings’, surrounded as we are by mobile phones, headsets, wi-fi environment etc., we have forgotten to enjoy nature, though we are earthlings.